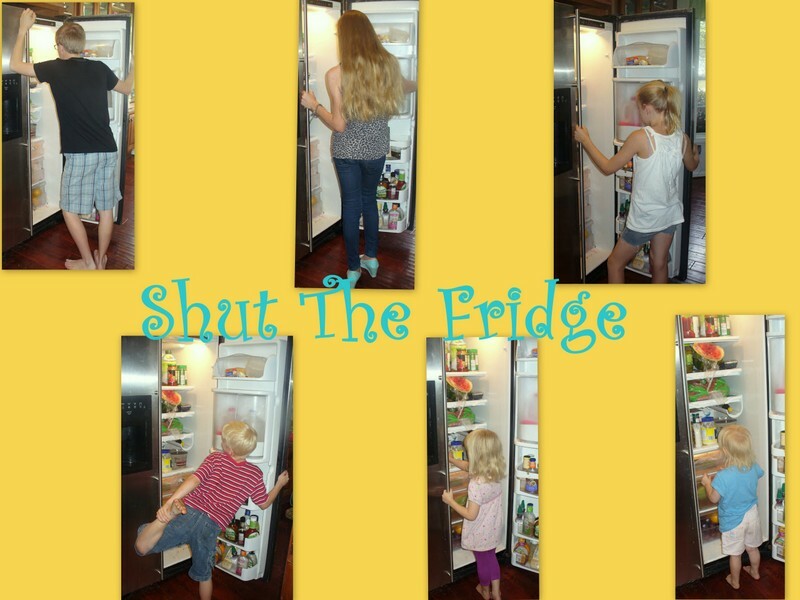 Shut The Fridge: Knights and Nobles and Maidens....Oh, My! My child with the biggest imagination is definitely, A-man. I mean, S-girl and V-girl play house all the time, but their games are just different variations on who is the mommy and who is the baby...with an occasional babysitter thrown in for fun. A-man, on the other hand, at various times in the same day, can be found to be Indiana Jones, a ninja, a cowboy, a lion tamer, a baseball player, various Star Wars characters, people from the Bible, and business men. But, his most frequent foray into characters is always someone who sword fights. He used to just use big sticks he could find in the woods. It is just what is sounds like. Weapons and shields made out of Duct tape. A-man used his own money to buy a sword at the convention. Best money he ever spent. So, now, that sword has performed double duty as a light saber, a rifle, the poky stick thingie to keep the lion from charging the audience, in addition to its many duties in the hands of A-man....the hero..
A-man bought the sword, I bought the book on CD on how to create the sword, helmet, shield and battle axe. So, when the chance came to review a product that put together unit studies on knights, kings, noblemen....and medieval times. I practically begged for it....just for A-man. It is something from Homeschool Legacy called Once a Week Unit Study. Which is, not so surprisingly, intended for you to use "once a week". We got to try the one I wanted to! Their Unit Study called Knights and Nobles. I am going to admit right up front that I didn't use this as intended. Sharon Gibson, the creator of this study, gave scheduling suggestions that sounded great.....but I didn't follow them. She suggests eliminating your "regular" school studies one day a week to work on this Unit Study. It really did sound like a great plan. But, Rainman and I are kind of ....how do I say it? Focused. We have beautifully crafted lesson plans. And, we have mental ideas of how much schooling should get done in a week and just couldn't bring ourselves to change our existing lesson plans to have a "fun" learning day each week. I know. What kind of parents are we??? So, we did what we always do and squeezed it in. We should have followed Sharon's advice and given it the special time it needed. I should probably explain to you non-homeschoolers what a unit study is, shouldn't I? Yup. We should have done that. I really have no good excuse for us. Sometimes, we get a goal in mind.....finish this book by this date.....and we cannot be swayed from our goal. The concept of unit studies are awesome. They just sort of scare me. The Once a Week Unit Study product is awesome....and really, not that scary. Once I started reading and trying some of the activities, I knew that I needed to do this the right way and not the "squeeze it in" way. But, then Rainman was in his car accident, and I spent all my free time on the phone with doctors and insurance companies, or researching information on the internet....and it didn't happen. So, this review is not going to be as thorough or as in depth as I would have liked. As a result of that, I am considering this Part 1 of my series of reviews on Knights and Nobles. -No prep work is required (I mean, really, she even has the library lists alphabetically and numerically arranged by Dewey decimal order....so even, if your library doesn't have the exact books she recommends....you will still be in the right area to find another book that will work with the unit.) I really am going to have to get over my near hatred for our local library system, aren't I? For this Once a Week study, you get a book that has everything outlined for you. For the unit study newbies like me, there is information on how to use this with your whole family....and also, what you will need. Like I said....from the library materials, and scheduling suggestions, all the way to family movie night and field trip ideas. It starts with picking some read-aloud books, in this case, suggestions like Robin Hood (Walt Disney version), The Emperor's New Clothes, Moi and Marie Antionette. D-man was reading Ivanhoe for his British Literature course, so that unintentionally blended right in. Then, it moves right into week one which focuses on Castles.....and a list of suggested books and movies and supplies that you may need. Then, after a brief family devotion, it moves into the "fun" stuff.....your activities. 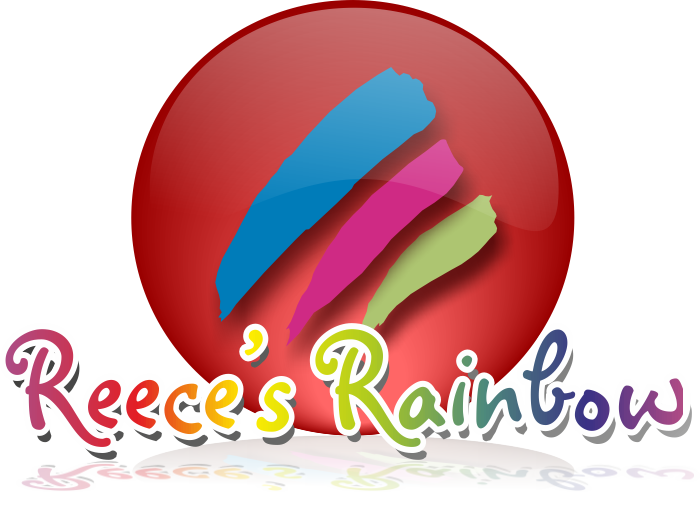 They cover subjects like; art, history, math, language, music. For the Castles lesson, your art portion would be building Lego or cardboard castles of your own. Then a field trip option would be the United States version of a castle...Biltmore Estates....which is actually not too far away from us....in North Carolina. Something that was fun for us was that the language portions of this book echoed what we had just been reading/learning in King Alfred's English. I do love it when seemingly unreleated things dovetail together so nicely. We liked the Stump Your Dad Trivia sections too.....although, I will admit that Rainman is sort of hard to stump. This is considered a 4 week study, so after week one studying Castles, you move into Kings and Queens, Knights and Life on a Manor.....then the whole unit is culminated with you creating a 2012 version of a Medieval Feast (meaning you can use your blender and use instant vanilla pudding in your custard recipe). The chapter on Knights was A-man's favorite....because there was the whole "armor" section about what they wore and what it was called. He has happily been "throwing down the gauntlet" to anyone who is interested in taking him on in a fight. So, were A-man and the rest of the kids happy with this mini course on Knights and Nobles? Yes....because most of them don't know how much we skimmed over. He was able to learn more about chivalry and the code of honor. He doesn't know we skipped over making a ping pong catapult yet....oops....the blackbird is out of the pie (you have to read this book to get that reference)! I love what the author, Sharon Gibson, says towards the end of the book. Once again, she is talking about how and why Unit Studies are a good idea. She writes about using your "tools" wisely. "As a hammer is to a carpenter, so this unit study is to you. The carpenter controls the hammer, not the other way around. Likewise, this unit study, as with any curriculum, is intended for you to control; it is not meant to control you. Trust your instincts. You know your children best. If you think it is necessary to make adjustments here or there, feel free." Rainman and I are the carpenters here...but, I think we each ended up trying to use the same hammer, at the same time, and didn't end up doing justice to this unit study. I needed to trust my instincts on this and let some of those already created lesson plans wait for a bit. So, I do need to make an adjustment....but not to the Once A Week Unit Study. It is put together really well and is easy to follow even for someone who has never really done a unit study before. I think Rainman and I are caught in the trap that we want our kids to look like they are learning and accomplishing so much at our homeschool, that we forget that our goal is supposed to be slowing down and letting the kids learn....really learns things....and not just get things checked off our carefully created lesson plans. So, have I thoroughly confused you yet? I am just trying to be honest that this resource was not fully used in our house and it was completely user error. I can say that everything surrounding Rainman's car accident was to blame for why we didn't use this like we should have. That was definitely a big part of things....but, it was more being able, on my part, to make a mental shift....away from textbooks and lesson plans and lists....to out of the box creative learning. Really....I feel like I am sort of a creative person. But, for some reason....skipping what I considered "real" school for a day....scared me. The more I read through the book....the lesson ideas and plans....as well as the information on how to get the most out of your unit studies though....my mind started reshaping itself...and I began questioning why I wasn't teaching more things in a unit study way. Really, the Once a Week approach is something that even Rainman and I....can adapt to....because we don't have to totally abandon our usual style and become, as Rainman would say, "those peace and love - hippy kind of homeschoolers!" My mental shift came too late for you to truly get a glimpse into how great I think this unit study is going to be when I let my hair down a bit and explore a different way of schooling....with a bit more abandonment than I allowed this time around. I guess that feeling really is part of my review. For a homeschooler that has a pretty strong focus on academics, the unit study way of thinking/learning may be hard, because it feels like it isn't really school. Over the years, we have found the total immersion, hands-on approach to learning to be more fun while simultaneously increasing retention of the materal at hand. Most importantly, when you experience learning and devotionals together as a family, you will be building a beautiful family legacy. Text books merely inform. Family time and loving moments help build a legacy. I want them to retain the information and not just memorize it for the test. But, more importantly, I want to build a legacy. The other thing that is a pretty cool deal on these particular Once a Week Studies is that they plan them to line up perfectly with Boy Scouts and American Heritage Girls, so your kids can be working on badges right along with the lessons. So, remember, this is Part I of this review. I am going to let my hair down and use this the way it was intended....and get back to you. In my pure...hmmmm....perfectionistic/list making way....I have penciled the medieval feast on our calendar, so I have a specific goal for us to work towards. I can't let my hair down completely, can I? I imagine this whole potential mind shift to a unit study way of learning is going to be traumatic for Rainman....it is so not the way he operates.....that should be fun, right? It will be worth coming back for Part II just for that part alone! You can get the Knights and Nobles unit study book for $15.95. There are a lot of other options for other unit studies. I will just list a few here, but go snoop around the Homeschool Legacy website to see what you think. Take a look at what other people on the TOS Crew thought of Once a Week Unit Studies. They are probably way better carpenters than Rainman and I! 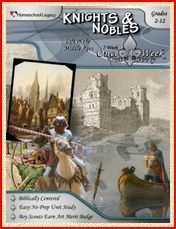 Disclaimer: We recieved a free ebook of Knights and Nobles, Once a Week Unit Study for free in exchange for an honest review.